Lombardo parts company with Lombardo & Gilles - Anthony Lombardo & Associates, Inc. WHEN ANTHONY Lombardo graduated from Santa Clara University’s school of law in 1982, he wanted to put bad guys in jail. There was only one problem: When he contacted the district attorney — now retired Judge Bill Curtis — he discovered there was a hiring freeze. So he interviewed at Noland, Hamerly, Etienne and Hoss, and didn’t get that job, either. A couple months later, though, the firm called him back. This time, he was hired. They sent their novice acquisition off to investigate a new fangled water management district that was being created, and a land use career was launched. Lombardo said he made partner in about four years. “I worked hard and had good mentors, like my father and Doc Etienne,” he said. Lombardo’s late father, Nick, was a prominent businessman. Among other things, he was the founder and owner of Rancho Cañada and the main stockholder in Laguna Seca golf course. When the younger Lombardo was old enough to attend catechism, his dad gave him the option of working at Rancho Cañada rather than attending the religious training. On reflection, he thought it was more about his father wanting him to trade his dollar-a-week allowance for a real job than any spiritual issues. He quick- ly chose working for his father and continued to do so until he graduated from law school. Lombardo continues to be active in managing operations at Rancho Canada and Laguna Seca. “I do that in my spare time,” he joked. In 1994, he left Noland Hamerly and founded the firm that would become Lombardo & Gilles, which grew in just over 10 years to 18 attorneys. In 2005, Lombardo said he realized he no longer wanted to “work around the clock.” He sold the firm to one of the partners, agreeing to stay on for another five years. At the end of 2011, he left and started his current firm, Lombardo and Associates, to focus on what he likes best: land use and real estate. “I enjoy helping landowners get through what appear to be innumerable obstacles to use their property,” he told me. His client list reads like a Monterey County Who’s Who — Clint Eastwood and Denny LeVett are there, along with just about every high-pro- file property you can think of: Skip Barber Racing School, Hyatt Hotels, Pasadera and Del Monte Shopping Center, to name a few. Charles Schwab is on the list, too — although Lombardo almost didn’t take that phone call. 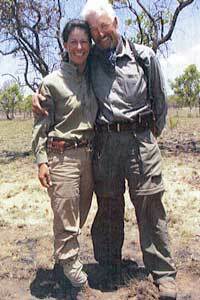 Lombardo also travels to Tanzania on safari, hunting animals like Cape buffalo. “They look at you like you owe them money,” he said of the beasts. “At least you can talk to city councils and supervisors!” The safaris are part of a conservation effort to keep wildlife from being pushed out of the area by grain and cattle farming. Proceeds from the safaris go to build schools and hospitals; meat not consumed by hunters and guides is given to villagers, so nothing goes to waste. His conference room sports paintings of the buffalo and other African scenes.